The India Energy Management Systems Market size is expected to reach $2,145 million by 2023, from $635 million in 2016, growing at a CAGR of 19.1% during the forecast period. Energy management systems (EMS) are devices that facilitate in monitoring and subsequently controlling the energy consumption of various assets, equipment, and appliances. The systems through its device sensors gather the data that are relayed to the database. In addition, sophisticated software algorithms facilitate assistance in reducing the energy consumption of the buildings through effective cost reduction approaches. The fast-growing Indian economy as well as emergence of Indias manufacturing capabilities after China is expected to provide lucrative business opportunities for the EMS market players during the forecast period. The government of India initiative for establishing the country as next manufacturing hub to leverage its large workforce into efficient utilization of resources is expected to provide substantial profitable opportunities for efficient energy distribution, consumption, and transmission consulting opportunities for the market players. Further, the development of public utilities and infrastructure through application of smart solution under the smart cities projects is also expected to drive the market growth in the coming years. However, lack of awareness among long-term benefits of EMS solutions as well as tough efficient energy policies hinder the growth of energy management systems market. 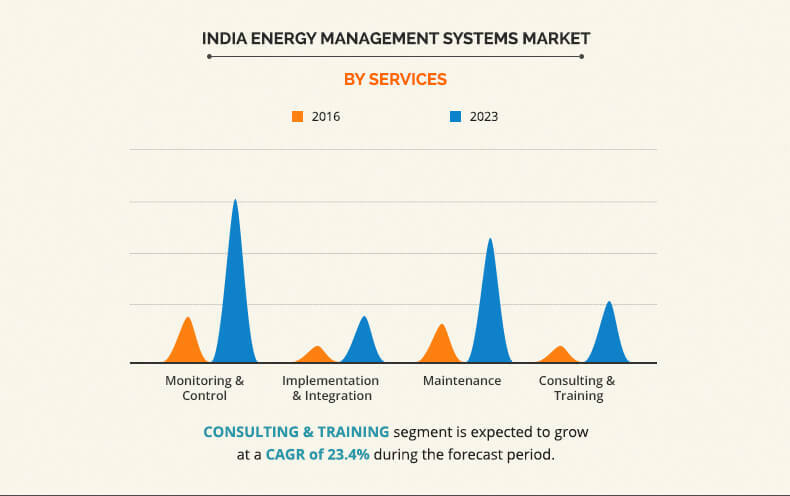 The India energy management systems market is segmented based on offering, service, component, type, end user, market vertical, and region. The offering segment is bifurcated into systems and services. By service, the market is broadly categorized into monitoring & control, implementation & integration, maintenance, and consulting & training. Based on type, the market is segmented into home EMS, building EMS, and industrial EMS. By components, the India energy management systems market is classified into sensor, controller, software, and others. The end-user industry is divided into residential and commercial segment. Depending on the market vertical, the India EMS market is divided into power & energy, telecom & IT, manufacturing, enterprise, healthcare, and others. The Indian market comprises of significant share for small and medium enterprise sector that are still relying on old techniques and manufacturing technologies. However, the government initiative to boost the manufacturing capabilities in order to match that of the developed economies has driven the adoption of EMS in recent years. Thus, monitoring & control, and consulting & training are expected to provide substantial profitable business opportunities for the market players in the forecast period. Moreover, the emergence of Indias manufacturing capabilities in automotive, steel and manufacturing is also anticipated to provide lucrative growth opportunities for EMS implementation, integration and maintenance in the coming years. The industrial EMS accounted for major market share in the Indian energy management systems market in 2016 due to significant adoption of EMS solutions by leading manufacturers. Further, this segment is expected to continue its dominant market share in the forecast period owing to increasing adoption of EMS based solutions compared to home and building EMS. The increasing demand from enterprise, offices, and commercial buildings to lower their cost of daily operations is also anticipated to fuel the market growth for building EMS solutions. Moreover, factors such as effective energy consumption of power grids, power distribution and transmission is also projected to offer attractive business opportunities for the EMS market players in India. Factors such as Indias fast-growing end-user industries, governments initiative towards adoption of smart solutions for its ambitious smart cities project is expected to drive the market growth of EMS in Indian market. Further, the presence of leading manufacturing players in automotive, food & beverage and other market verticals is also anticipated to fuel the demand of EMS based solutions in the forecast period. However, low awareness among small and medium enterprise for long term benefits of EMS as well as lack of stringent energy efficiency policies is expected to restrict the growth of market in the coming years. The report also analyzes the value chain analysis, business model as well as case studies based on challenges and the subsequent solutions achieved through effective implementation of EMS solutions. Competitive analysis and profiles of the major India energy management systems market players, such as Atandra Energy Private Limited, Computer Maintenance and Services Company, Delta Electronics, Inc., DEXMA Energy Management, Elconn Energy (India) Pvt. Ltd., Energy Management Solution of India (EMIS), Graphite Technologies Pvt. Ltd., Neptune India, Nikom InfraSolutions Pvt. Ltd., and Yokogawa India Ltd. are provided in this report. Product launch, acquisition, and collaboration were the different key strategies adopted by key players to establish themselves in the market. The report provides an extensive analysis of the current and emerging trends and dynamics in the India energy management systems market. Elconn Energy (India) Pvt. Ltd.
10.1. Atandra Energy Pvt. Ltd.
10.5. Elconn Energy (India) Pvt. Ltd. The fast-growing economy as well as rapid urbanization is expected to drive the demand for effective power distribution and transmission across the country. Subsequently, driving the market growth of energy management systems in the country. The systems offer effective and efficient energy consumption solutions through its systems and software solutions monitoring & controlling capabilities. Moreover, services such as training and consulting is also anticipated to provide profitable business opportunities for market players among owing to low awareness among small and medium enterprise owners. In addition, the maintenance services for leading manufacturing players in the country continues to propel the market growth among industry verticals. By market vertical, the power & energy accounted for significant demand for energy management for efficient distribution of power. Subsequently, is expected to drive the market growth in the forecast period. Moreover, the rising manufacturing capabilities of leading Indian manufacturers is also fueling the adoption of efficient energy management solutions, thereby propelling the market growth in coming years. Leading market energy management players have adopted strategies such as mergers, acquisition and product launch to establish their dominance in the Indian market. For instance, Schneider Electric along with Temasek have entered into an agreement to acquire the Electrical & Automation business of Larsen & Tubro, India and merge with its Low Voltage & Industrial Automation business segment in India. The acquisition is expected to boost the Schneider’s capabilities in Indian market to address the high demand for energy management and industrial automation market. "India Energy Management Systems Market"